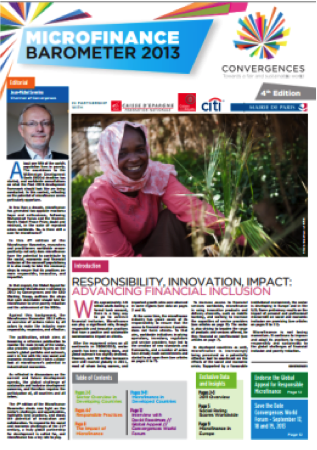 The 2013 Microfinance Barometer: Who will serve the next billion clients? With 2.5 billion people lacking access to financial services globally, headlines on microfinance usually refer to the staggering need for financial inclusion. But the 2013 edition of the Microfinance Barometer decided to contrast this need with an overview of the institutions currently serving the sector. Based on data provided by MIX, in cooperation with Citi Microfinance, the lessons coming from 1,400 institutions reaching 94 million clients evidence the expansion of a more diverse and established microfinance sector. However providing appropriate financial services to the next billion clients requires the participation of an even larger and more varied range of local institutions, financial services providers and other inclusive business models. In 2011, the loan portfolio of microfinance institutions grew by 15 percent globally, and up to 25 percent in Africa and Latin America. Yes, this is a slowdown from the 25 percent global growth rates experienced previously by the industry. But at a time of higher competition and maturity, it can be welcomed as a sustainable and cautious development of the sector. With a 3 percent decline in overall client outreach in 2011, the sector has seen the impact of the 2010 events in Andhra Pradesh (India) and the subsequent shutdown of activity (which caused a 20 percent decline in the number of borrowers in India alone). However, for the same period, Africa and Latin America posted a 15 percent increase in the number of borrowers and, since then, India is showing signs of recovery. From the 1,400 institutions reporting to MIX in 2011, the top 100 names represented 80 percent of the total outstanding loans, and more than 75 percent of the borrowers reached in 2011. This is an important but sometimes overlooked characteristic of the current microfinance sector. Some of these leading institutions are significant players in their local market, and they demonstrate an increasing integration of the microfinance sector within the formal financial system. In 2011, 67 percent of microfinance borrowers were served through bank or non-bank financial institutions – compared to 33 percent through non-profit institutions. In line with the diversified needs of microfinance clients, more institutions are acting to diversify their product offerings. Deposit-taking institutions are now prevalent in most regions, and 54 percent of institutions can offer both savings and credit products, which should open the door for the development of more scalable microsaving programs. On the other hand, only 26 percent of institutions reporting to MIX offered insurance products, and 54 percent offered non-financial services, such as financial literacy or health education programs. Microfinance institutions will remain crucial to reaching underserved communities and building access to financial services. However serving the next billion clients requires addressing different market segments and financial needs with specific requirements in terms of distribution and products – for example, clients in rural areas, or those in need of supply chain financing. The need of underserved communities remains so large and diverse that it requires the integration of other service providers to design appropriate and tailored products for clients that have not been reached yet. The GSMA, the global network of mobile operators, shed light on some examples of other suppliers and partners of financial services. The GSMA’s Mobile Money for the Unbanked program conducted the 2012 Global Mobile Money Adoption survey, for instance, which highlighted 30 million active mobile money customers undertaking USD 4.6 billion in transactions during the month of June 2012. It also counted 520,000 registered outlets, 82 million registered customers globally and 150 active live mobile money services for the unbanked in 72 countries. Despite positive signs of growth, an important gap remains between the needs of underserved communities and the availability and access to appropriate financial services. Looking forward, the challenge in measuring sector progress is to account for and capture the innovation, diversity and scale of the multiple providers reaching underserved communities and contributing to an inclusive financial system. Published by the platform for thought Convergences (a network of public, private, and solidarity-based groups focused on promoting the Millennium Development Goals) and sponsored by the Caisse des Dépôts, Citi, the Fédération Nationale des Caisses d’Epargne, and the Mairie de Paris, the fourth edition of the Microfinance Barometer offers a worldwide overview of data, trends and actions taken by various stakeholders – microfinance institutions (MFIs), investors, regulators and researchers – to make the industry more responsible, responsive and effective. You can download the 2013 Microfinance Barometer here. Marjolaine Chaintreau is currently Vice President of the Citi Microfinance team that has a special focus on financial inclusion in Latin America and Africa.